Bake a cake in the Classic Wonder Mold Pan. This pan is the shape of the gown and has a heat core that fits in the middle so that the cake will bake evenly. Also bake a ten inch round cake. The reason for this cake is that you are using a Barbie doll in the center and you need the height for the Barbie doll to fit. Sit the gown cake (from the Classic Wonder Mold) on top of the ten-inch round cake using buttercream icing. Cut away the edges of the ten inch round cake making it even with the gown cake. Cut a strip of pink rolled fondant for the top of the gown. Apply it the Barbie doll and trim, wetting the back seam with water. Stick the doll into the center of the cake. The flowers can be made from pink fondant using a small flower press made especially for fondant. Or they can be made with pink buttercream icing and star tip, size #16 and applied straight onto the gown. Use white icing and round tip, size #3 to make a dot in the center of each flower. Finally, with white icing and star tip, size #18, using a zig zag motion do the edge of the gown as shown in the picture of the above Barbie cake. 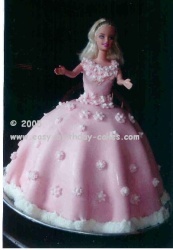 Note: The Barbie cake can also be iced in buttercream icing using star tip, size #16 for the gown. You can cover it completely using the star tip or you can also use rose tip, size #124 to make ruffles or use a combination of both. The ruffles are made by holding an icing filled bag with rose tip touching the surface slightly at an angle and use a zig zag motion as you lengthen the ruffle. Finally, decorate the gown as you wish. You may want to practice on wax paper first all of the designs that you want, and then make them on the gown. Don't miss these other popular pages!